We are in the time of the consumer. Technology has been the catalyst for putting the purchasing power in the hands of your customer. It has created a market in which consumers can use search, online reviews, friend recommendations, banner ads, research reports, and countless other resources to research, review and choose a product or service. This is a spectacular evolution in capitalism, nationally and globally. Apps are the epitome of this transition from brand-specific push marketing to consumer-driven, needs-based interactions. Mobile is a personal medium, and when a customer invites your app onto their phone, it’s because it provides value or solves for a need. Retention isn’t necessarily about cool new features, press placements and getting their first. Instead, it’s about the experience you create that users love. In this post, we outline seven ways you can evolve your app experience to retain users. Initial retention means going beyond the download. How do you ensure that your new user doesn’t abandon the app after his first use – which 25% of users will do? Today, customers are using their favorite apps more than ever, but installing new ones fewer and fewer. Too many brands today focus all of their efforts on acquiring new users and the number of app downloads they’re able to secure. But getting these users through the door is only the first step. In order to reach the right mix of your target customer audience and general awareness that all apps want, you should invest in organic promotion (via App Store optimization, social media, microsites, and PR) as well as paid ads. These ads will give you access to a highly targeted group of potential users who have the interests and attributes that are in line with your app. Essentially, the people who will want to use your app day-to-day to improve or enhance their lives. You don’t want to squander these users (and your ad spend) but overpromising in the ad itself, misleading with features that aren’t fully baked, or generally coercing the user into a download. In order to get the most bang for your buck, and to discover new users who will actually want to use your app again and again, keep your ad campaigns simple and honest. Think of the problem they want solved, the information they want access to, or the content they’re interested in, and make it clear that your app is the right resource for them. 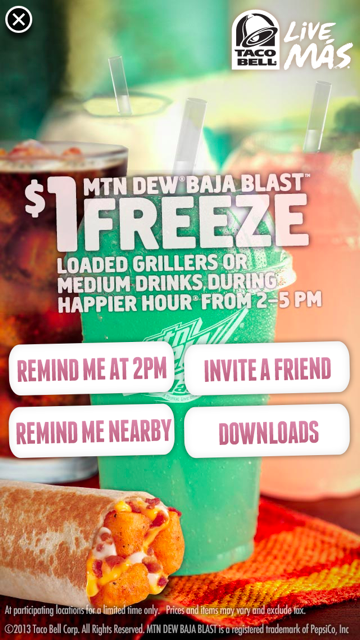 That’s what Taco Bell did with their fanastic #OnlyInTheApp campaign. Doing as Taco Bell did, you can ensure that your user has the right information from the get-go, and is converting on the ad because they are genuinely interested in using your app, which improves initial retention rates and decreases the risk of paying for one-time users. Your users can interact with you or your competitors across a number of different channels – so what makes apps unique? Apps were created with a purpose: to help a user accomplish a task. They’ve evolved to become not just task-oriented, but to provide a user with an easy and efficient way to accomplish something. Apps are only used if they’re useful, and providing value is the hands-down best way to ensure your user is engaged. The best apps are those that address key user scenarios and create an experience to suit each. Your experience should reflect what your users are trying accomplish in your app, and give them an easy, interesting and enjoyable way to do it. What if your user is just browsing? Make sure it’s clear how to navigate back to search, or how to easily share something, and store their search history so that they don’t have to re-type anything. Is your user more likely to book events or buy tickets via app? Have a secure, easy and short step-by-step completion process clearly outlined, give recommendations of additional events that he might be interested in based on his previous orders, and send a confirmation push, in-app or email message to wrap up the experience. There are a number of ways to make your app experience a great one. 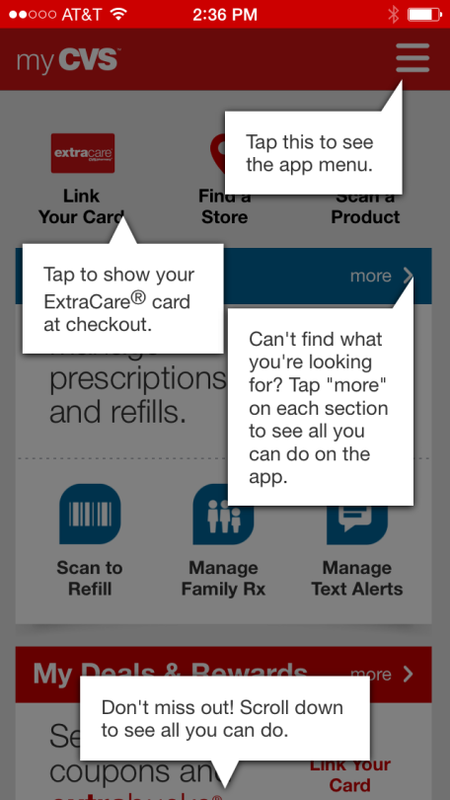 One way CVS does it is by providing “helpful hints” upon first app open, to assist the user in navigating to the feature they need. Think about the experience, not the feature. Then, as you grow your user base, you’re already planning for them and how they can use the app, rather than your own standout features (unless, of course, they overlap). How do you know why a user abandons your app after the download, or returns three times in one week? Analytics. In order to understand your user, his experience and how he’s actively using (or not using) your app, you need a foundation of data and to be tracking metrics that reflect real actions. Not only does this give you insight into how users are interacting with your app and what their experience is like, analytics show you the ways they want to interact with your app, but might be hitting a roadblock with. Data can highlight the best and the worst in your app experience, determine features that work and those that don’t, and are crucial in identify usage and retention trends over time, so that you know the longevity and loyalty of your users. Using tools like Profiles, you can also collect user attribute information and incorporate data on their interactions with your brand across other channels to analyze alongside in-app behavior. With this information in hand, you can supplement app usage insights with details about who your users are, and use that framework to create stronger experiences and run better marketing campaigns. The alternative name of this section is, simply: Give the user what he wants. When we say “app marketing,” we’re primarily talking about the ways in which you can use messaging tactics to engage, re-engage and retain your app users over time – as opposed to focusing only on acquiring new users. Essentially, how you can use messaging like push notifications, in-app messages and email to elevate the app experience and provide the user additional value. 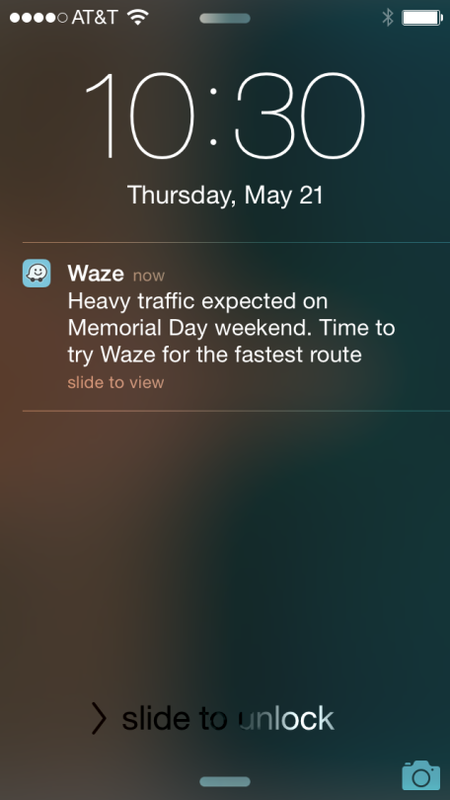 This doesn’t mean spamming your user with constant requests for app feedback and surveys. It doesn’t mean sending 5+ push notifications a day in an effort to get more app opens. And it absolutely never means using app messaging as a marketing spam platform to blast all of your users with information important to your brand, but not to them. What you do want to use messaging tactics like push notifications, in-app messaging, SMS and email for is to provide information, offers, and content relevant to your individual user, his interests, and his past experiences. This is where the close integration of app analytics and marketing tools becomes so necessary. The best campaigns are those that are founded in real user data, and aim to provide only what is relevant based on his experience. User feedback should be a critical factor in defining your app feature roadmap, and how you want to grow and evolve your mobile offering over time. NPS surveys are hugely helpful in gathering this information while a user is in-app and their thoughts top-of-mind, but only if it’s clear that you actually want to use this feedback to improve your app, not just your App Store rating. You can also use other channels to gather user feedback, including email and in-store questions. Don’t forget to look at forums, online communities and other gathering places for venting frustrations and asking questions – don’t just make your user come to you with guidance. We’re well on our way to automatically predicting users who are likely to churn without the hassle of pulling together individual reports. The first step in doing so is to identify the behaviors, actions and attributes that are often associated with churned customers. Once you have those, you discover which of your users are at low, medium or high churn rates – and, more importantly, how to re-engage them appropriately to prevent app abandonment. The churn factors for each app can be unique, so bring a team together of product managers, engineers and marketers to help define yours. Once you start tracking potential churn, you’ll know the “why.” That means you can target these at-risk users with the messaging, content and app experience that they want, and aren’t yet getting. It’s also a learning opportunity for your brand in developing and growing your app. While mobile has been around for a while, apps and app owners are only now starting to hit their stride in figuring out what users want.